These are a few of my yard sale finds. I stumbled upon a church yard sale and they told me they had just cleaned out this old lady’s basement. I was hyperventilating with all the vintage wares. like this pink vintage apron for $.25 There were 8 and I bought all 8 aprons for 25 cents each. You can still smell the flour from where…I’m sure she baked the best biscuits. and this bread tin that was also $.25 I will use it in my studio to store stuff. I love the green patina color. 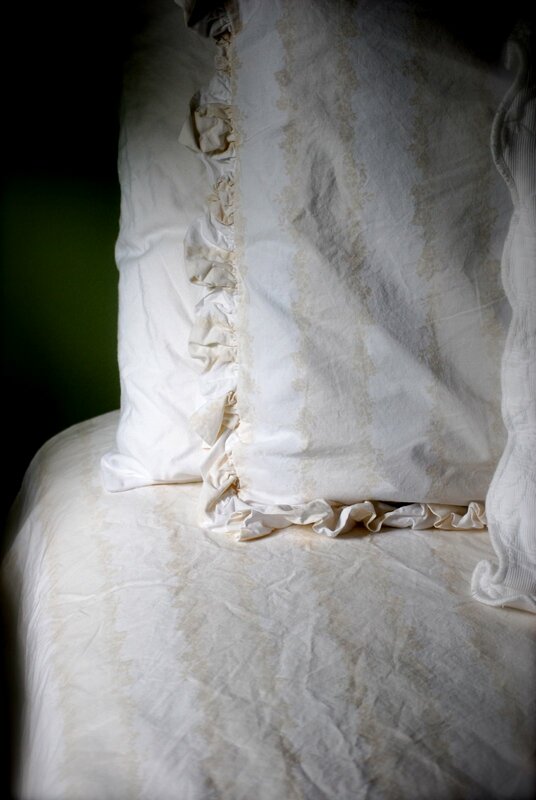 I found this Simply Shabby Chic king duvet with shams for $5.00 Do you ever feel guilty that you’re getting a steal? Me neither. I’m participating in Southern Hospitality’s Thrifty Treasures Party. Make sure you go check out the other treasures scored this weekend. Oh wow, what a steal on the aprons, and I LOVE that bread box! What a great sale that was! You got lucky! The apron is just too cute and the duvet and shams…gorgeous! 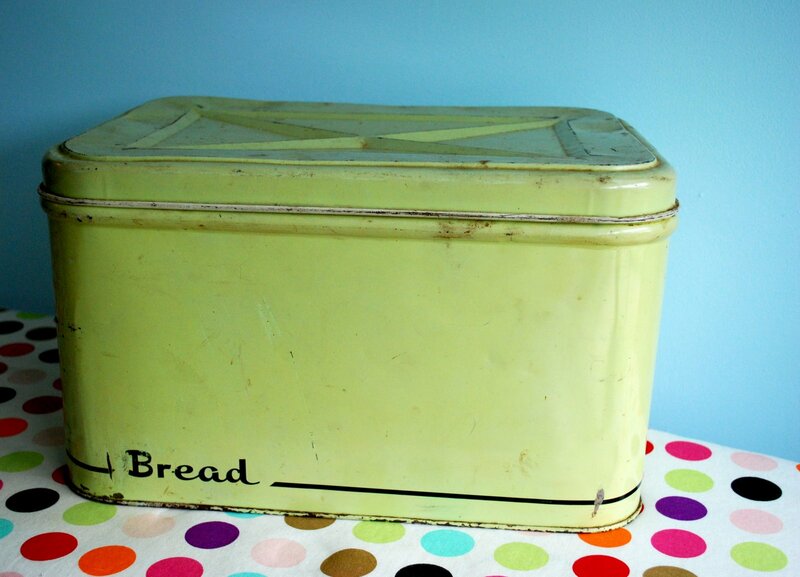 I have the same bread box in pink! I store my household files in it. That way I don't mind doing my bills!! awesome finds! the aprons would make me drool. the pink vintage apron was sooo cute I thought it was a skirt! great finds! Oh my gosh, what a bargain you got on that king duvet set. I'm gasping for air over here! Score!! OMG!!! Gorgeous finds. I would love to stumble upon such wonderful deals. Love, love, love all of it. Vintage is precious! Wow! What great finds!! I love the bread box! Hey, there friend! You really scored on all these goodies. What great prices & such cute vintage things. So glad you joined the party. LOVE the apron! What great finds at great prices! How fun! Me = so very jealous! holy moly, what a steal at those prices! You did score some great stuff! 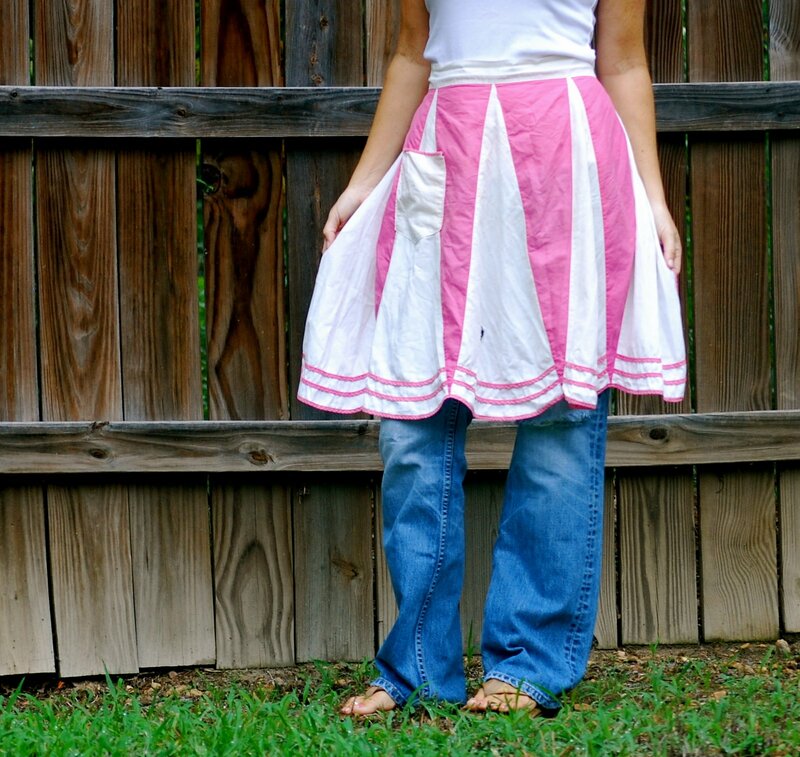 I LOVE vintage aprons….and you got them for s super price! Love the shams too. I LOVE great deals!! Lucky girl! Aprons are my thing! I can't believe the price–wish you had shown us all of them! I'm completely jealous of your great finds! I think I just shed a tear at how precious that apron is! My aunt collects them and they really do tell a story about the woman that wore them. I have 1 apron and every time I put it on, I just have the best feeling! 25 cents is unbelievable! I love the bread tin also! The Duvet set is absoultely gorgeous! I've been looking for one for about 2 years and have not found one yet. I'll hold out! You did Awesome! Love the aprons and that bread tin is soooo awesome! Love it!! I really love your purchases. Especially like the duvet and shams, I could see them in my house totally. Good eye. Boy, did you stumble on some good stuff! I love aprons! And that bread box is great! boy did you find some great stuff…i LOVE the apron…i found you doing a search for slipcovers…your tutorial is amazing and i may just give it a go…i will let you know if i do…thanks for the inspiration!!! I've never found stuff that cute for that cheap. Oh. my. word. Love it all! guilty? never!! goodness now those shabby chic linens have my name all over them…right? lol! Stumbled across your bog from THE NESTER. wanting to get it off. Well I don't have a quick solution, however I have been buying OLD pictures at thrift stores and painting them with chalkboard paint. Then I canjust hand and take down whenever I want to! I LOVE that tin! and the polka dot table cloth is on is adorable! ahh I love all this stuff!! I love getting good/great deals on things especially antiques. I love the apron you've shown and that bread box is precious. I would love to garag sale/estate shop EVERYDay if I could, so much fun exploring through the possible treasures. Wow! Great finds. Totally jealous bout those aprons! Love your site, it's seriously one of my favs! That tin bread box…. so cool! When my grandma died and I was cleaning out her place, I found one very similar to that in a closet. It was full of treasure.. fabric squares and nine patch quilt blocks that my great grandmother had started years and years ago. Fun finds! HI! I absolutely love the apron!! How fun is it to find great items like those! Are you interested in selling one of the eight that you found? I would love one! Oh I am SO JEALOUS! Love everything you got, and they were practically free. It would have been a crime not to get all 8 aprons! Oh my goodness. Aprons and a bread box. I'm about to drive over and steal 'em. I thought about you today when The Nester and I were talking about last year's Those Creative Women! I'm thinking we're going to do it again next year sometime (my three month away baby is putting a halt to the schedule), so I hope you can come! Hope your daughter's birthday was fun! Wow! You did find some treasures! I love finding great deals, especially since sometimes I feel like prices at garage sales are way too high for garage sales! I bet you skipped out of there doing the happy dance!